We are doing a series on Barefoot Running in India on WellthyFit. Click here in case you missed the first one which is all about basics on starting barefoot running. This blog is the second in this series and focuses on the long distances one can do with barefoot running. It breaks many myths on long distance and barefoot running. 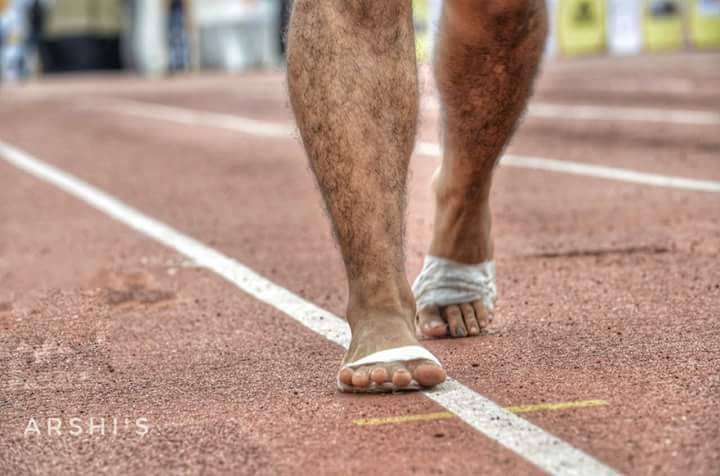 The guest blogger is Inderpal Khalsa – His impressive and exhaustive resume is right here and that should be good enough to say why I chased Inderpal to share his knowledge on Barefoot Running on this platform. 12hours Mumbai Ultra 2014 ran 86kms in total from which around 40kms was barefoot. 2015 Bangalore 24hours Stadium run. Ran around 70kms barefoot. 2016 36hours Stadium run clocked 212.4kms. Out of which around 100kms was Barefoot. 2017 24hours Mumbai Stadium run. My Journey with running started in mid of 2013, July with ‘Run India Run’ 10kms timed event in Boravili, Mumbai. Since then there was no looking back, I switched to distances very fast, with 10kms in start I went to 21kms and slowly 42kms in 6months. And I ran my first SCMM Full Marathon in 4.06, those were the times when I used to wear Nike Lunar glide 5 Shoes. I started Running Barefoot since end of 2014. It’s been almost 3 and a half years since I have started running barefoot. My training location was always a fixed one, RCF Sports Ground in Chembur that is a 450 meters big ground with green grass. My running mentor Rao Sir who is running from past 12 years advised me to run barefoot on ground instead of running in heavy shoes. And that was the day I got hooked to barefoot running. Who Inspired me to Run Barefoot: Milind Soman and Thomas Bobby Philip. Keep your body free while running barefoot. Try to Meditate While running by focusing on your breathing and your steps. Try to merge your breathing and your steps in coordination. Over speeding without warm-up and stretching can cause Shin Splints very fast in barefoot. On Inclines, one can feel the elevation gain in his legs when the road is being elevated due to hills. You may develop a more natural gait and strengthen the muscles, tendons and ligaments of the foot. You will learn to land on the forefoot rather than the heel. You may improve balance. Without shoes, you activate the smaller muscles in your feet, ankles, legs, and hips that are responsible for better balance and coordination. You may feel more grounded. The major difference – Barefoot Running vs. Running in Shoes. One of the major change I observed was the form. I started to run in shoes again for an upcoming event that was “Run the Rann 161kms”. It was then I found that the form of running barefoot and running in shoes is totally different. It took me around 10kms to adapt the form of shoes from barefoot running. And the same happened once I resumed to barefoot running after Run the Rann event. Breaking the Myth of Running Distance (ultra) In Barefoot. Since 2016 I never invested in Shoes, my investment was in buying one pair of skinners, apart from that I had a pair of Vibrams ( Gifted from a runner). Tested at yogi hills trek and it worked amazing for 10kms . Leather is taken from Dharavi market. The laces of the sandlas are also made from pure leather. Customized handmade designs are made on the sandals finally taking in mind the achievements of the user and his qualities. Learned the originality from my buddy @kierendsouza and made some modifications after that. Many people used to say that running Ultra and beyond 50kms in barefoot is not possible. While that was the time I attempted running barefoot for 12 hours in Mumbai stadium run. And luckily I ran my highest distance of 99.4kms in 12hours securing 3rd position in the event. After this there was no looking back and I experimented running barefoot in 2017 24hours Mumbai stadium run. And I clocked 140kms with an ease in that event. Post this there was a major event where I gave all my experience, 48 hours stadium run Bangalore. The pain that I experienced in those 48 hours is something beyond imagination. After 30 hours in event my feet started burning as the skin had started to come out due to friction. So I took the rest 18 hours easy clocking total of 188 kms in Total with pure barefoot running technically making a New Indian record of Running the longest distance Barefoot. You often get Blisters while Running Barefoot? While one has to run distance in Barefoot the most important thing is to focus on Strength Training. Barefoot running requires strong calf, quads, glutes, and hamstring muscles. It is very important to strengthen your ankle for running long distance in barefoot as lack of ankle strengthen may lead to ankle swelling. Unlike Shoes Barefoot running lacks Cushioning. That’s the reason one can feel the ground directly. Since there is no cushioning one has to focus on strength training to avoid cramps and soreness in barefoot running. Where there are trail patches I often switch to Minimalistic like Vibrams or Skinners. Well concluding this article, everyone has different tastes and likes. But one can always try to include barefoot running at least 1 or 2 days in their training schedule. It’s a good way to condition your legs as well as the small muscles of your lower body.